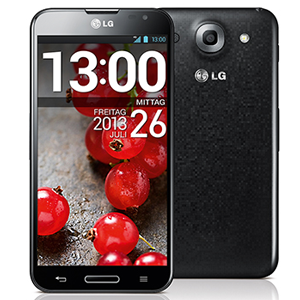 The LG Optimus G Pro is the flagship smartphone for LG released in May 2013. It is available on AT&T's wireless network with LTE connectivity. The Optimus G Pro is powered by a quad-core Snapdragon processor with a 1.7 GHz clock speed on all four cores. It has 2 GB of RAM and 32 GB of internal storage. The internal storage can be expanded with a microSD card that can be up to 64 GB in size. The LG Optimus G Pro has a 5" True HD LCD screen with a display resolution of 1080p. The rear camera is a 13 MP camera, with the front-facing camera having a 2.1 MP resolution.